Jewish Family Service becomes the first beneficiary agency of the Jewish Federation of South Palm Beach County. 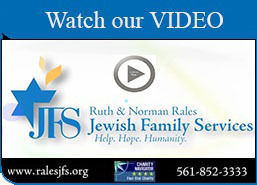 Jewish Family Service is renamed Ruth Rales Jewish Family Service. Recognizing that many in our community can not afford to put food on their tables, JFS started the Forster Family Kosher Food Pantry which began with 32 families and served our community’s needs until 2012. JFS became an independently incorporated 501(c)(3) non-profit agency, fully responsible for its program decisions as well as obtaining funding for all programs and services delivered to the community. JFS responded to an important community need by implementing the Welcome Home Program Drop-in Center for the persistently mentally ill. The goal of the program was and still remains to assist those living with persistent mental illness to improve their life skills, social skills and employment skills. In 2010 the program expanded to include adults with developmental disabilities functioning at a high level of independence in community settings. JFS won the Area Agency on Aging's Outstanding Provider Award for dedication and excellence in serving seniors during Hurricane Wilma. The results from the area’s first major Jewish population study in 10 years confirms that South Palm Beach County has the oldest Jewish residents in the country. Sixty-two percent are over 65, and 40 percent are over 75. Further, 81 percent of low-income Jews in South Palm Beach County are 65 and older. In June the Agency received a three year grant from the Area Agency on Aging to be the Lead Agency in providing services to seniors and their caregivers in South Palm Beach County. JFS hired a bi-lingual social worker and began a partnership with the Caridad Center, a health clinic in Boynton Beach. That year we also acquired land in West Delray Beach, adjacent to Temple Anshei Shalom in preparation for the development of a state-of-the-art facility for residents in the community members aged 60+. The Agency received re-accreditation from the Council on Accreditation (COA). Additionally, JFS became accredited by Non-Profits First, a local accrediting agency. We also received a federal earmark for our "Stopping the Pain of Youth Depression" Program providing mental health services to the public schools. The Agency broke ground on a new 12,000 sq. ft. center located in west Delray Beach. Funding for the construction of the project came from a grant from the Florida Department Of Elder Affairs, the Jewish Federation of South Palm Beach County and several local donors. The decision to build this facility was made following the 2005 demographic study which showed a large highly concentrated 60+ population residing in Delray Beach. Many of these residents live on fixed incomes and currently receive services from JFS. One year later the Shirley & Barton Weisman Delray Community Center was opened. The center provides the perfect combination of social services with cultural, social, educational and recreational programs, and is run primarily through the use of volunteers. In an effort to expand the agencies services to at-risk children and families in the community JFS added two part time case managers for families and children in crisis. Responding to a growing need among divorced families, JFS trained their first parent coordinator to help high conflict families resolve issues related to the welfare of their children. In the fall, the food pantry was moved off campus to a new 2600 sq. ft. facility located at 430 S. Congress Avenue and was named the “Jacobson Family Food Pantry at JFS” with a generous gift from Anne and Norman Jacobson. The pantry provides bi-monthly food deliveries to over 500 individuals needing help with one of life’s most basic necessities. Ruth Rales Jewish Family Service (JFS) announced at their annual Gala on December 12th that the Rales family, a highly successful and philanthropic family with ties to South Florida, made a generous $2.4 million gift to establish the “Center for Families and Children” creating four new programs at the agency geared to helping JFS raise its profile in serving families and children. Those programs include Career and Employment Services, Domestic Abuse Education and Action; Community Outreach and Financial Assistance for Summer Camp and School Readiness. In addition, JFS renamed the agency to include Norman Rales name to honor of his legacy of financial and personal support for the agency, and his commitment and passion for helping those less fortunate. The patriarch of the Rales family, Norman passed away in March of 2012. Each year, JFS serves more than 15,000 individuals. The agency's staff includes licensed clinical social workers, psychologists, psychiatrists, and case managers. JFS receives a 4-Star Charity Navigator rating putting JFS in a very select group of high performing charities. The Conference on Material Claims Against Germany (The Claims Conference) significantly increases its support to aid victims of the Holocaust. In March JFS is recognized by the Sun Sentinel as a “Top Place to Work” in 2015 and is recognized as the 10th best place to work in the small employer category. In June the agency started their “Rales Rides” bus service to the Weisman Delray Community Center as a result of a New Freedoms Grant. As part of the Board of Director’s strategic planning process dealing with planning for the future needs of seniors living in our community, the JFS board approved the creation of a separate entity to be known as “JFS at Home” which would provide companion and homecare services to seniors living in our community. In April, JFS at Home received its license to operate in Palm Beach County from the Agency on Healthcare Administration and officially opened its doors for business in May. Also that year the Norman and Ruth Rales Foundation made a second $2.4M grant to the agency to continue to fund the Rales Center for Families and Children. For the second year in a row, JFS earned a 4-star rating from Charity Navigator, America’s largest independent charity evaluator, and was once again named as a “Top Workplaces” in the small employer category by the Sun Sentinel. In January JFS received news from the Claims Conference that their allocation would increase by $1.7M bringing the total program funding for our Holocaust Survivor Assistance Program from that source to $4.2M. As a result of continued growth, the JFS Board of Directors approved the leasing of additional space and a 4,300 SF space was secured in April. For a third consecutive year, JFS earned a 4-star rating from Charity Navigator and was once again named a “Top Workplace” in the small employer category by the Sun Sentinel.